Judith and Holofernes is an oil on panel, painted by the Italian artist Artemisia Gentileschi (1593-1653). Artemisia was a major exponent of Caravaggesque school. She worked in Italy and England. The episode depicted in the painting is taken from the Bible. Judith, with the help of her maid, kills Holofernes, the enemy general, after having seduced him. The painting represents the killing of Holofernes in a realistic and really raw way. The two women belong to different social classes, as we can see from their clothes and their attitudes: Judith seems almost worried - while she beheads the man - not to get dirty with blood, while the maid has peaceful expression. However, they work together to overcome the physical strength of the man. 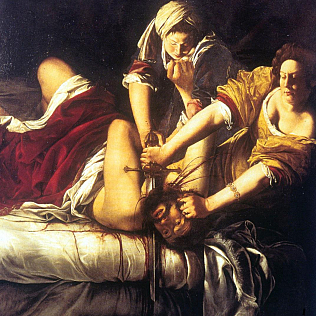 According to the traditional interpretation of the painting, it represents the desire for revenge and justice that Artemisia felt against the man who raped her. The painter in fact suffered a sexual assault: her attacker was tried and suffered a light sentence. The courage of Artemisia\'s public testimony has made her a symbol for the twentieth century feminism. Artemisia painted another work with this subject, that is in Naples.